This is the 15th edition of the Exhibition for pumps systems and equipment for industrial processing, The Pumps & Valves show. 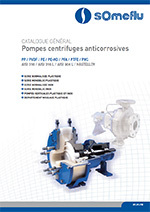 A complete overview of all the technologies and innovations in the field of industrial pumps, valves and seals, can be found on 18 and 19 April 2012 in Antwerp, Belgium. This exhibition is communication and information platform in the industry and offers the exhibiting companies the opportunity to present to an audience of experts here. Visitors can find in depth and comprehensive information here about the latest developments, trends, products and services in various fields. With its local partner, the company APUMAS, SOMEFLU will be on the show.